RAMSAMMY, MICHAEL 2013. Word-final nasal velarisation in Spanish. Journal of Linguistics, Vol. 49, Issue. 01, p. 215. Hall, Nancy 2011. The Blackwell Companion to Phonology. p. 1. Hall, T. A. 2011. The Blackwell Companion to Phonology. p. 1. Paul de Lacy (2006). Markedness: reduction and preservation in phonology. (Cambridge Studies in Linguistics 112.) Cambridge: Cambridge University Press. xviii+447. Adelaar, Alexander & Himmelmann, Nikolaus (eds.) (2005). The Austronesian languages of Asia and Madagascar. London: Routledge. Battistella, Edwin L. (1990). 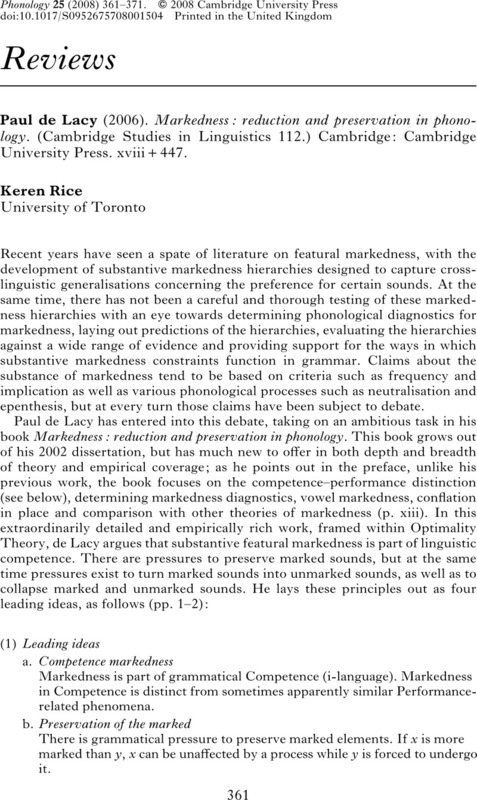 Markedness: the evaluative superstructure of language. Albany: State University of New York Press. Causley, Trisha (1999). Complexity and markedness in Optimality Theory. PhD dissertation, University of Toronto. Chomsky, Noam (1986). Knowledge of language: its nature, origin, and use. New York: Praeger. Cowan, H. J. K. (1965). A grammar of Sentani. The Hague: Martinus Nijhoff. de Lacy, Paul (2002). The formal expression of markedness. PhD dissertation, University of Massachusetts, Amherst. Denwood, Philip (1999). Tibetan. Amsterdam & Philadelphia: Benjamins. Duanmu, San (2000). The phonology of Standard Chinese. Oxford: Oxford University Press. Haspelmath, Martin (2006). Against markedness (and what to replace it with). JL 42. 25–70. Holmer, Arthur J. (1996). A parametric grammar of Seediq. Lund: Lund University Press. Howe, Darin & Douglas, Pulleyblank (2004). Harmonic scales as faithfulness. Canadian Journal of Linguistics 49. 1–49. Hume, Elizabeth (2003). Language specific markedness: the case of place of articulation. Studies in Phonetics, Phonology and Morphology 9. 295–310. Hume, Elizabeth & Georgios, Tserdanelis (2002). Labial unmarkedness in Sri Lankan Portuguese Creole. Phonology 19. 441–458. Ikoro, Suanu (1996). The Kana language. Leiden: Research School CNWS. Klamer, Marian (1998). A grammar of Kambera. Berlin & New York: Mouton de Gruyter. Klamer, Marian (2005). Kambera. In , Adelaar & , Himmelmann (2005). 709–734. Lichtenberk, Frantisek (1983). A grammar of Manam. Honolulu: University of Hawaii Press. Lombardi, Linda (1998). Coronal epenthesis and unmarkedness. University of Maryland Working Papers in Linguistics 5. 156–175. Lombardi, Linda (2002). Coronal epenthesis and markedness. Phonology 19. 219–251. McCarthy, John J. (2003). Comparative markedness. Theoretical Linguistics 29. 1–51. Nababan, P. W. J. (1981). A grammar of Toba Batak. Canberra: Research School of Pacific Linguistics, Australia National University. Nielsen, Konrad (1926). Lærebok i lappisk. Oslo: Brøgger. Pham, Hoa (1997). The coronal-velar relationship in Vietnamese dialects. MA forum paper, University of Toronto. Poppe, Nicholas N. (1960). Buriat grammar. Bloomington: Indiana University Publications. Prunet, Jean-François (1990). The origin and interpretation of French loans in Carrier. IJAL 56. 484–502. Rice, Keren (1996). Default variability: the coronal–velar relationship. NLLT 14. 493–543. Rice, Keren (1999). Featural markedness in phonology: variation. Glot International 4:7. 3–6, 4:8. 3–7. Rice, Keren (2007). Markedness. In Lacy, Paul (eds.) The Cambridge handbook of phonology. Cambridge: Cambridge University Press. 79–97. Schuh, Russell G. (1998). A grammar of Miya. Berkeley: University of California Press. Smith, Ian R. (1978). Sri Lanka Creole Portuguese phonology. Vanchiyoor, Trivandrum, India: Dravidian Linguistics Association. Svantesson, Jan-Olof, Tsendina, Anna, Karlsson, Anastasia & Franzén, Vivan (2005). The phonology of Mongolian. Oxford: Oxford University Press. Trubetzkoy, Nicolai S. (1939). Grundzüge der Phonologie. Göttingen: van der Hoeck & Ruprecht. Translated 1969 by Christine A. M. Baltaxe as Principles of phonology. Berkeley & Los Angeles: University of California Press. Zobel, Erik (2005). Buol. In Adelaar, & Himmelmann, (2005). 625–648.